Long flights to a new place are common to all three types of bees in India. Giant bees seem to migrate to a new location under the influence of changing weather conditions, due to lesions of the wax moth, or lack of a harvest. 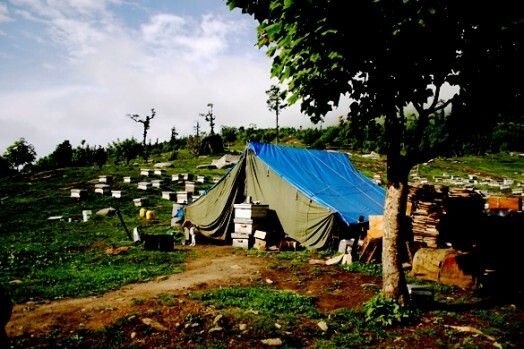 Giant bees fly in Nagrota area (900 m above sea level) and the valley Kangrz in late March and early April, and fly back before the rains in mid-June. In Punjab, there are 3 types of honey bees, which have adapted to adverse climatic conditions. 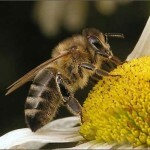 Indian honeybee (Apis indica F.) lives in a hilly area. Dwarf honeybee (Apis florea F.) lives on the plains, where the temperature rises to 49°C (120 F). Giant or rocky honeybee (Apis dorsata F.) lives in the foothills and low hills. Family of giant bees builds one big cell on the wall of a rock, on the branches of a large tree (Ficus bengalensis, Ficus reitgiosa, mango). Sometimes bees stick the cell to a house of man. One tree can lodge in branches 50 and more families. 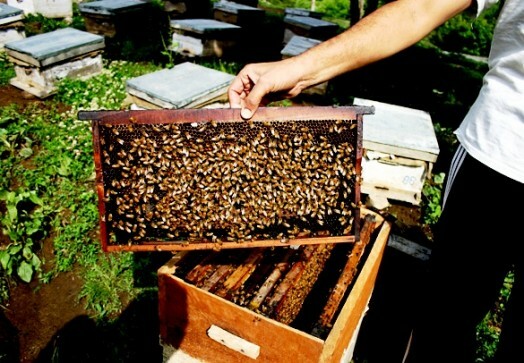 So there is a “natural air apiary”. Cell dimensions are impressive: the thickness is 150 -180 cm (60”), height – 60 cm (20”) or more. The thickness of the cell in the brood part is 3.6 cm (1.5”), thickness in a honeycomb part is up to 10 cm (4”). Worker bees are of the same size as the queen of Italian bees (length 16 to 18 mm (0.7”), 1 kg consists of about 7000 bees). 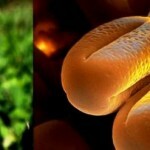 It is noteworthy that cells of the worker bees and drones are the same. Giant bees are very hardworking. They start work early in the morning and finish in the evening later than the Indian bees. From one family you can sometimes get up to 36 kg of honey. Bees are very aggressive. Their stings are very painful and in some cases lead to death. Irritated bees stalk their prey for a long. They are reluctant to leave the victim, even if it is in the water. Some people are able to handle the giant bees, and their body, apparently, does not so swollen from the stings. Families migrate from one place to another and during the flight make a characteristic loud sound. Attempts to place the giant bees in hives have not been successful. Dwarf bee much less than Indian bees. Families build single cells, usually in the bushes, on fences, on the branches of trees, under the eaves of houses, chimneys, folded cotton stalks, in the empty boxes and in other places. Cell area is slightly higher than the palm area of the hand or is equal to it. Dwarf bees are so peaceful, sometimes they are called stingless bees. These bees can not live indoors, so they build honeycombs mostly on high, well-lit areas. Dwarf bees have a greater tendency to swarm and long flights. 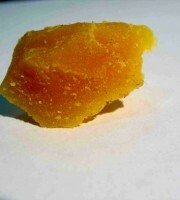 Families collect very little honey, a single cell contains about 450 grams of honey. 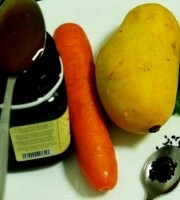 Honey is liquid, but has healing properties. Indian bees usually settle in the hollows of trees, often peasants leave indentations in the walls of their homes, so bees can build their honeycombs. 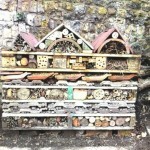 Swarms of bees settle in specially prepared nest boxes and clay hives. Body size of worker bees and brood cells depends on the altitude above sea level. In the valley of Kullu there are 2.1 cells per linear centimeter, and in the valley Kandra – 2.2 cells. 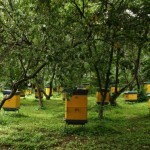 Bees in the lowland areas of India build 2.4 cells per linear centimeter.According to some observations, with rising above sea level the cell size for worker brood increases, families become more numerous and collect more honey. However, these observations need to be scientifically proven. Indian bees are peaceful, not run around the honeycomb, are easily soothed by using smoke, often they can be inspected without smoke. The bees like to swarm (one family releases up to 7 swarms). 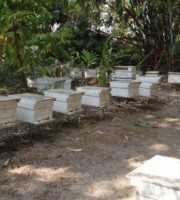 In some cases, excessive swarming is explained by the small sizes of local hives. Laying worker bees appear shortly after the loss of the queen. Families completely unprotected against wax moth. 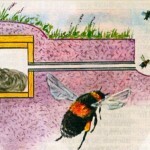 Indian bees do not work so well as a giant bees of India or Italian bees. Average honey harvest is 3.6-4.5 kg from the family. 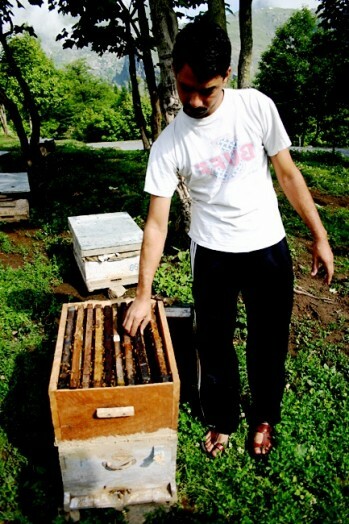 In 1936, the state apiary in Nagrote used the hive of Langstroth and received 14.5 kg of honey from one family. 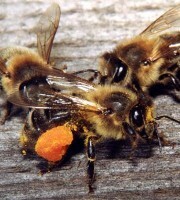 Flights and gatherings are common to Indian bees. Theft is also very common among them, which is particularly enhanced when the family of giant bees begin to rob the family of Indian bees. Families of dwarf bees change their residence twice a year, depending on weather conditions. But they do not fly long distances, like giant bees. Indian bees like gatherings. Often in the period when there is no swarming you can see entire families of Indian bees in the air. Sometimes the cause of the gathering is fasting, wax moth, ants, excessive heat, absence of a queen, appearance of laying worker bees. However, in some cases, the bees fly off for no apparent reason. 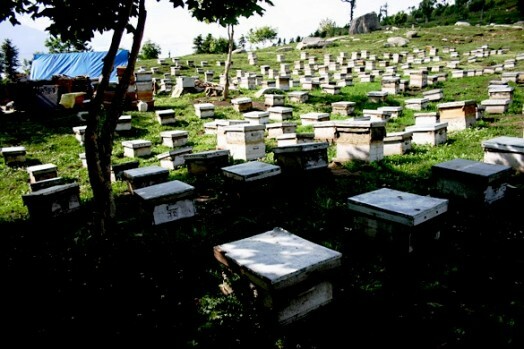 Families with fetal queens and 1-2 frames of brood of all ages, can leave their hives to join another swarm. In 1880 and 1905 Benton has made unsuccessful attempts to bring the giant bees to Europe and America. Date finally managed to do it in 1883, however, the bees clearly preferred to live in the open air and attached their one cell to the high branches of the tree. Congratulation to what you are doing. We recently started our beekeepers Group known as Bweteta around Pare mountains – Same – Kilimanjaro – Tanzania. We would like to if you can work with us leading us to achieve our objectives since you are in the industry for such a long time. Hi.. What will be the income from this farming? What is the correct way to make the main box? 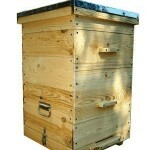 My question is how many large bee box can you use for making baby bees? My neighbor has more than two high.